I bought my first watermelon of the season this morning. They’ve been in season for some time, but I just wasn’t in the mood. Watermelon wasn’t created to be eaten on cloudy days. And that is France for you this summer. A sunny day here and there. Like this morning. So I thought it is summer. And bought a watermelon. I stared a long time at this cute little round fruit on my table. How very elegant, I thought, very chic and small enough to carry in my basket. It can even fit into my fridge. I could even have chosen a yellow one and one without seeds….a watermelon without seeds! What has civilation done to us? Let me tell you a little about those I grew up with. I run the risk of being tagged as a tough, sturdy amazon after this, but that’s OK, you might be thinking that already! I love a huge long, oval watermelon, big and lush in its greenness. Too big for the basket or under the arm. Too big for the fridge. And too big for a dainty lady like me too carry. You need a strong quarterback. You scratch it, you knock it with that knuckle, move on to the next one, scratch it, knock it, nod your head and Mr Qurterback lifts it onto his shoulder. This prize is taken home and wrapped in a cold, wet cloth, stored in the coolest corner of the garden, often splashed with cold water to keep it cool. Then, there’s a time and place to eat a watermelon. It is not eaten as an amuse bouche at a candle lit dinner table with a drizzle of balsamic, or cocktail picked on a pretty platter or served on a bed of mesclun with fancy feta cheese or graniteed, a la mediterannean!It is eaten on a buzzing hot, late summers afternoon, cut up by Mr Quarterback right there on the lawn, into proper oblong watermelon slices, crackling broken off so that the luscious “crown” is displayed, the creme de la creme, and a sigh escapes from all onlookers, eager awaiting their slice. You then dig into your share with bare feet and hands and gusto. Finesse and manners have no place in eating a watermelon. With your slice, you plonk down on the grass and chainsaw through it, with your knees almost draped around your ears, making room for the dripping juices and seeds. Every so often you’ll shake those hands to prevent the juices from running into your armpits and you’ll spit those seeds gathered in your cheeks olympic distances. That’s how a watermelon asks to be eaten. The only knife in sight will be the panga for slicing it up and a small knife for Aunt Posh, who doesn’t want to dig her freshly coiffed hair into a slice. Then of course comes the smearing and peel-attacking and seed fights and the pool and the throw-ins…. But unfortunately, I’m miles away from that kind of watermelon. So, here is mine from this morning… decently small, round and chic, calm and quiet…. and the clouds just moved in front of the sun. CARA! CARA! CARA!! I am entralled!!! Are you SURE you didn’t grow up in the southern part of the US!!?? Your decription of watermelon eating is so perfectly SOuTHERN!!!!! GLORIOUS painting too, cara .. it drips those juices of sheer delight!!! now to go fine some too! even though it’s raining (finally!)! Dang, now I need to go buy a watermelon!! great description and a luscious looking painting! The painting is gorgeous! I love the impressionistic style you achieve and intense colors. Ronell, you are such a talented writer! Your posts transport me somewhere else, and your art is beautiful. I really like this watermelon painting- it is dazzling. Juicy, juicy. And light dappled. Summer in the UK is also dreadful. Rain and floods, people drowning. Awful. Your wonderful story took me straight back to hot summer days of my childhood! The only difference beng we were always ensconced on a local island, camped out for the whole summer. Mom would come over on the weekends after work, Dad and I would take the boat across to pick her up along with new grocery supplies for the week. Always Dad would look for the biggest watermelon and we would have a feast back on the island sitting on the beach, not a care in the world! Well heck girl…you paint such visuals verbally and with the brush. The painting is gorgeous and the writing equal to the delightful painting. I loved reading this. How far can you spit? LOL – Yeah, how far can you spit, Ronell?! 😉 Lovely story, beautiful watercolour. Watermelon eating is exactly the same in Australia. My mother always made the man tap the melon – he’d cut a triangle into the side and slide out a perfect piece – if it wasn’t perfect enough, he’d slip it back in and try another. That was always my favourite piece. I hate to break it to lin, but we ate watermelon this way growing up in the north too! I remember being sticky from finger tips to elbows after eating watermelon. And Mom yelling not to touch anything as we made our way inside to wash up. Good memories!Your lovely watermelon looks so beautifully red that I am sure it must be sweet and juicy even if it is a petite little thing.It’s good to see you back in the swing of things Ronell! Ok, now I want a watermelon party with you! It’s been raining ALL DAY here today…Thankyou for bringing a little sunshine into my life.Beautiful post in every way! Oh, Ronell! Your last drawings are soooo beautiful. I love the use of watercolours you’ve done. They are to be published in a book! mmm – my comment from yesterday disappeared! This is gorgeous – the colors are just right and your style gets more confident every day. Well you got my juices flowing now, and You are so right about the right way to enjoy a watermelon.Great writing, and sketch. Ronell, I just tried to email you but it did not work from my work computer. Thaks for your comments on the Kookaburra. I left some more info under comments for that piece. I hope that helps. …what a nice story and what a wonderful painting! Keep up the good work, Ronell! Ronell, your work just keeps me going, knowing it is possible to create such glowing work with such a free touch and such depth, and life just inspires the h-ll out of me! And your lusty love of life likewise! I think I’m going to make watermelon liquados today….cut up watermelon, throw it in the blender with crushed ice, some sweetner and water and blend till smooth…..c’est tres bon! I’m glad you are gettings bits of sunshine! I would love a cloudy day! 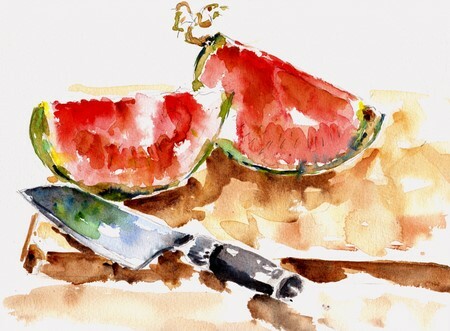 Gorgeous, gorgeous painting of a very juicy watermelon!! Your narrative took me down memory lane too. Thanks!! You’ve been busy while I’ve been away! What gorgeous paintings. That watermelon is setting my mouth watering! Fantastic. And that color work, especially on the knife, is intoxicating! though we were not allowed to get into spitting competitions, making a mess while eating melon and mango was taken for granted. i too would like to know how far you can spit the seeds 😛 lol. beautifully painted and very well written. it’s good to have you back. My hands feel sticky just reading this! You conjour up memories of blue skies, sparkling pools, and the cool crisp pink flesh of watermelon. Mmmm mmmm. Seems like a very distant memory this summer! Love the painting too – you create such interesting compositions just by leaving a knife or whatever in. You’ve got that rich pink just right – it sparkles like it should. Lovely. This wan just readiates joy. Very nice. Fabulous watermelon in all it’s glory. Your words just broke me up. When are you writing your book? All these wonderful paintings and commentary need to be preserved for everyone. what a gorgeous watercolor. It’s so beautiful! Your post is absolutely delicious on every level. Thanks for sharing. This makes one’s mouth water! It really expresses the nature of watermellon: if you really enjoyed it surely you need a shower. Great sketch! Hi, this is my first visit to your blog and I love your paintings! That watermelon is perfect. Thank you everybody! I actually still wanted to spit those seeds and measure my distance, but haven’t gotten around to it yet..
will dot it and publish it!